Divulgar meus trabalhos relacionados ao meu personagem como também assuntos e matérias referentes aos temas quadrinhos e animações. Os dois ABESTADOS lobinhos parecem não entender a gravidade da situação! 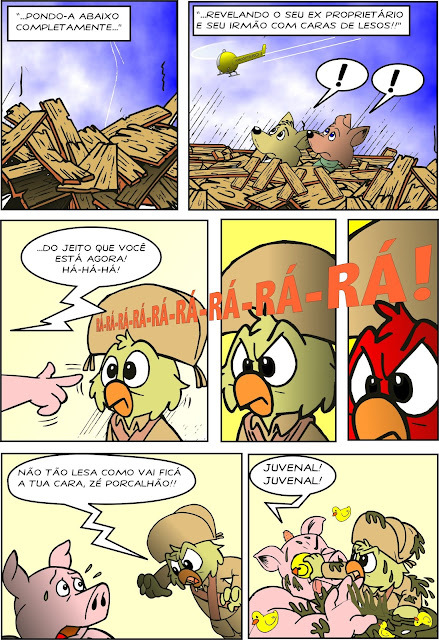 Isso parece deixar a nossa coruja favorita meio ARRETADA! O que é que falta acontecer nessa história? Bem...chegamos ao final da segunda parte e já preparando as emoções para o capítulo final dessa trilogia que está conquistando o mundo! Não perca, ok? O ZÉ CORUJA saiu muito irado do apartamento do ZÉ PORCO! Agora ele precisa encontrar os seus amigos LOBO! 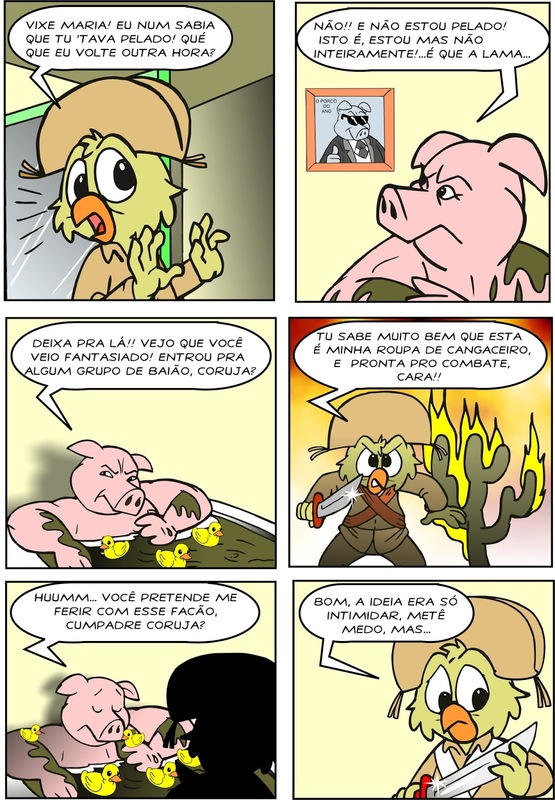 O ZÉ CORUJA foi expulso com toda a delicadeza da propriedade do porcalhão ZÉ PORCO! Como o nosso amiguinho vai resolver essa situação? Não deu outra! 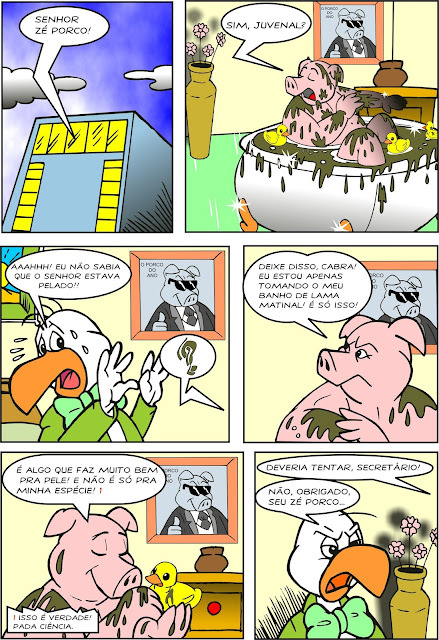 Depois de tanto debochar da cara do nosso estouradinho cangaceiro nessa história, explode o maior BAFAFÁ na torre do ZÉ PORCO! 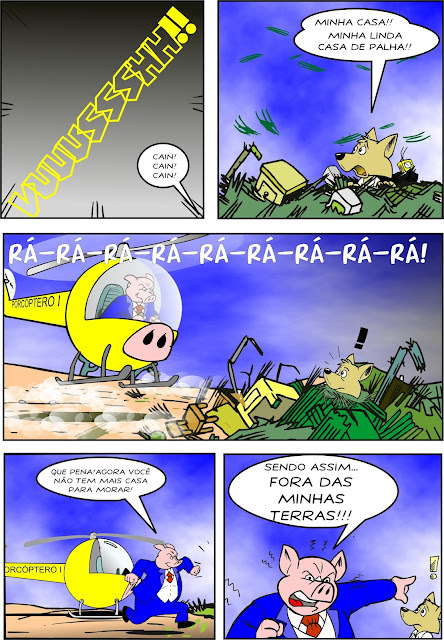 O vilanesco porco ZÉ PORCO faz suas revelações bombásticas para o nosso heroizinho deixando ele completamente surpreso! E o clima vai esquentando dentro da torre infernal! Mais uma página dessa obra concebida por Marcos, Arnaldo, Milson e Valcir pra vocês! E continua o drama mexicano no apartamento do cara mais porco dos quadrinhos! O nosso confuso ZÉ CORUJA está para ter mais surpresas nessa história! O que será? O clima esquenta ali no apartamento do VILÃO! 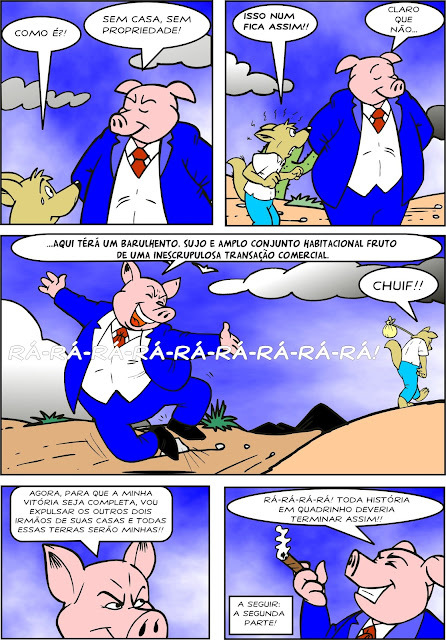 Além do ZÉ ter que aguentar a visão terrível de um porco pelado e gordo dentro da lama, ele tem que aguentar o cinismo desse que é causador de tantos problemas nessa história em quadrinhos! O convencido ZÉ PORCO fala das propriedades terapêuticas de um ótimo BANHO DE LAMA para o nosso simpático xeleléu JUVENAL, mas parece que a ave não se interessou muito. Eis que uma outra ave muito esquentada entra no recinto! E o nosso QUERIDO e ODIADO vilão ZÉ PORCO? Com tudo isso acontecendo o que ele estará fazendo nessa história? Bem...falando nele, olha só o que ele está fazendo! 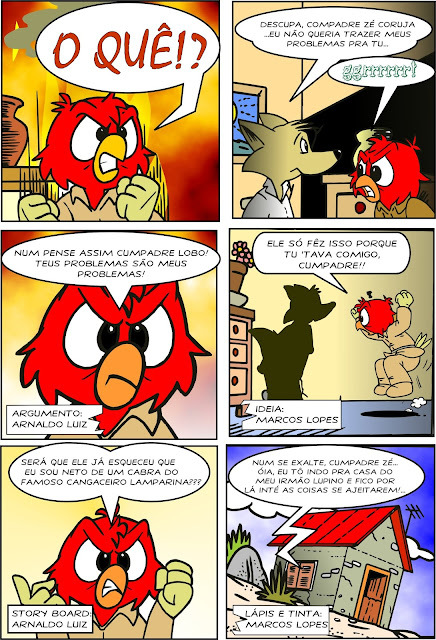 Continue acompanhando esse drama que está deixando o lobinho com lágrimas nos olhos e saber o que o ZÉ CORUJA vai fazer pelo seu amiguinho! 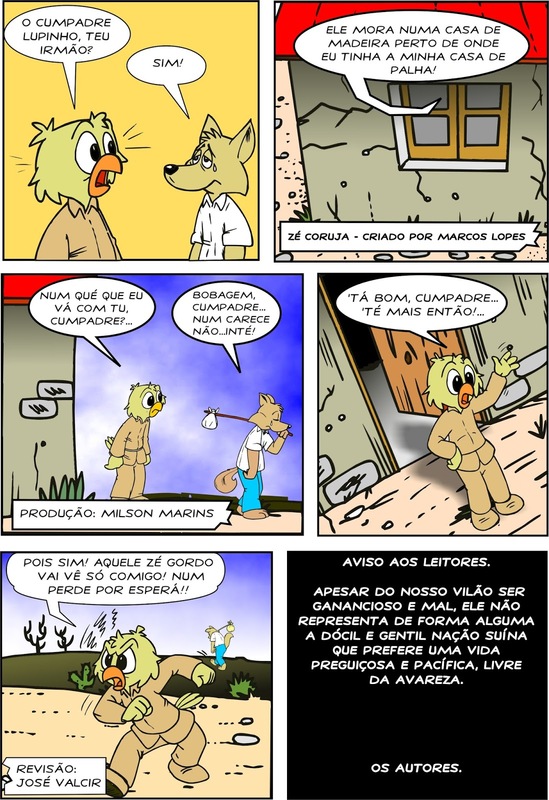 Ação e emoção concebida pelos cérebros MILSONLOPESARNALDOVALCIR. Ao saber o que aconteceu com o seu "cumpadre" LUPÉRCIO, o ZÉ fica tão vermelho de raiva que a gente quase que gasta toda tinta vermelha da gráfica para imprimir essa página! KKKKKK! Era uma vês, num sertão fictício, na cidade DISTANTE e fictícia de BREJINHO, no estado de PERNAMBUCO (esse, de VERDADE, é claro! KKK!) no BRASIL, um incrível drama se desenrola! 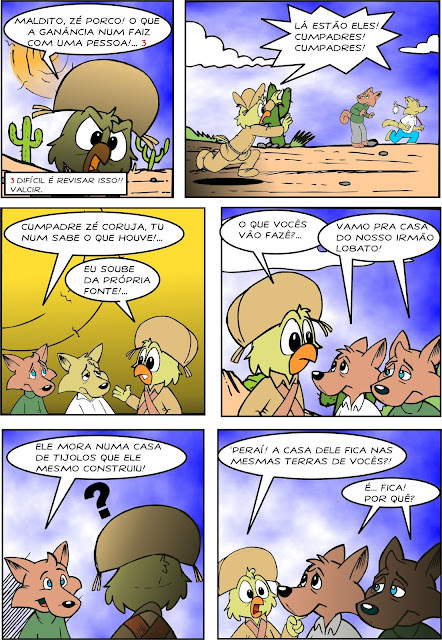 O nosso terrível vilão ZÉ PORCO, destruiu a casa de palha do nosso simpático lobinho LUPÉRCIO, para revendê-la para uma grande construtora da capital...Bem, vamos ler esta que é a sequência da nossa trilogia FÚRIA DE TANTÃS por que temos muito drama pela frente, certo? Boa Tarde meus caros amigos e leitores deste BLOG! Neste final de semana não teremos postagens, mas, estou editando a sequência de FÚRIA DE TANTÃS para a próxima segunda-feira 20/07/2015. Aguardem , pois a continuação está mais repleta de ação, humor, suspense e violência...(OPS! Violência não! Brincadeirinha! KKKKK!) Nos veremos lá! And now? What will become of our little wolf stressed that no longer has a place to live? 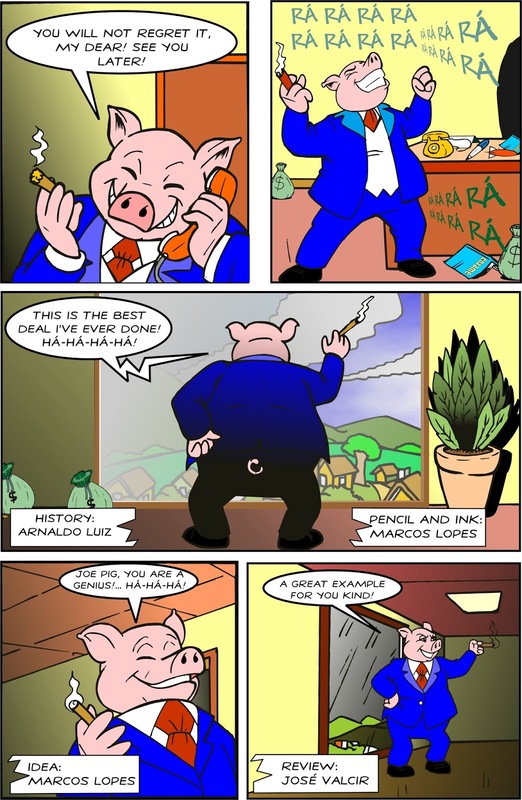 The "puffy" JOE PIG managed to destroy the house of Lupércio and this is now no longer having a place to live is forced to withdraw from his property. With this situation, we finished the first part of this adventure. Do not miss next week the continuation of this SAGA! What was this ?! A violent gale? An earthquake? A Tsunami? I wonder what happened to the straw house of our friend Lupércio? Oh no! 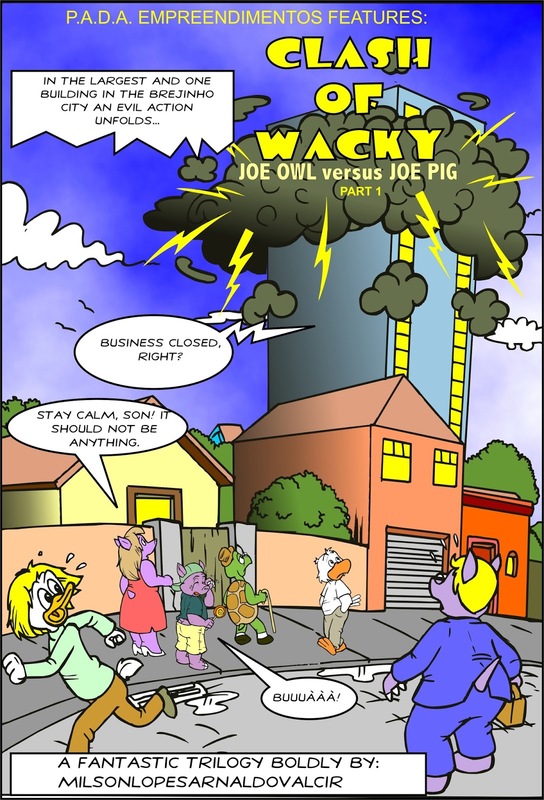 It was our known and hateful villain JOE PIG with its sinister PIGCÓPTER that I had blown the house of our little friend. Looks just like JOE PIG left angry! The Lupércio sings victory, but the JOE OWL knowing the villain as he knows, you know that is not the case. Our Villain JOE PIG tries every possible way to convince the Lupércio to sell their property but do not get hit. Will he was satisfied? We will follow this story to see how it will end? 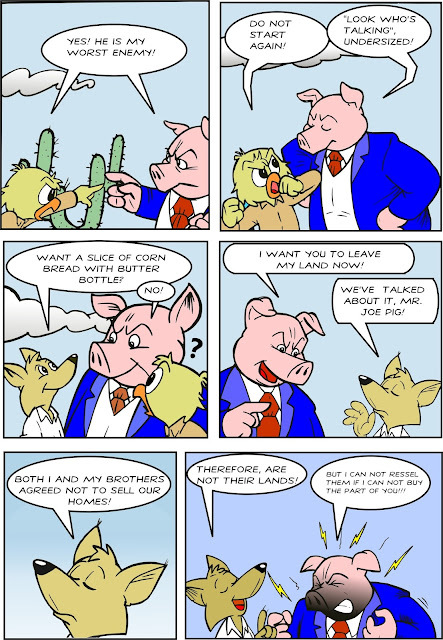 The situation is boiling out of the house and our little friend Lupércio tries to appease things offering a slice of CORN BREAD with BUTTER BOTTLE, but Joe Pig is not too interested in it! Your goal is another! Finally two guys who do not peck (if one can say so ...) are face to face again live and in color! Get ready for a confrontation of those! Will Be?!? And you should be asking: Where is our hero JOE OWL? 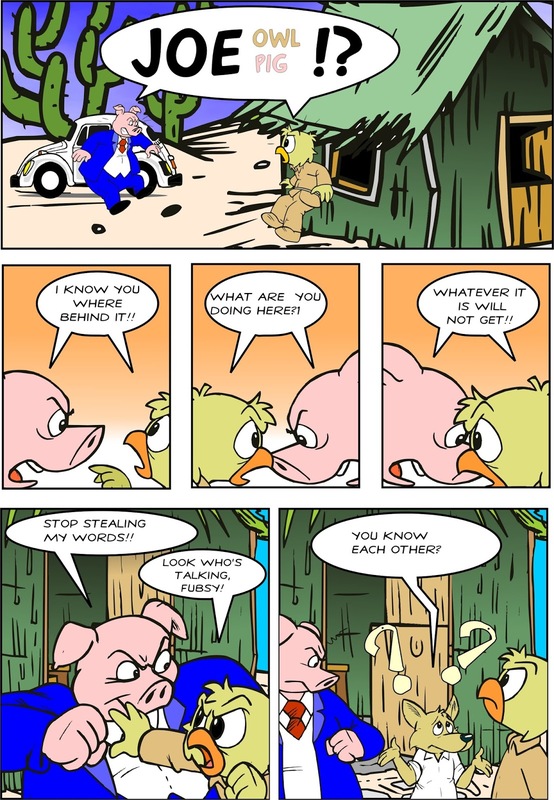 Finally we find the sixth page of this story and a good one! Look that! Well ... on the Today page, The EXPLOSIVE JOE PIG after being thwarted in his plans, decides to go personally to the site where the JUVENAL was unsuccessful in such trading. 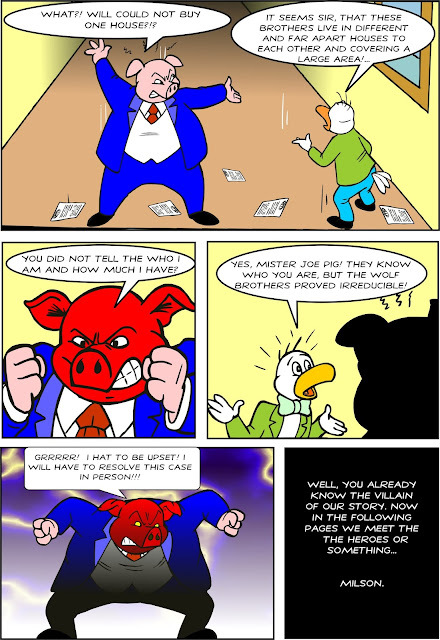 THE TOWER OF JOE PIG tremble with rage our villain! Poor little JUVENAL who had to endure the angry shouts and the breath of that giant pig! What is the reason for JOE PIG think that a genius? Well, every villain of comic books or real life think they are the rulers even, right? But then our villain here is one more reason to play the expert. Now let us see who is responsible for this sinister transaction! HUMMM! It had to be him! PIG JOE! It seems that our villain does not get tired of sneaking of yours! Let's see what the reason for his joy? Good Morning, my BLOG readers friends funnier BRAZIL owl! We're back with another TRILOGY our little hero in his biggest adventure in the city of Brejinho! 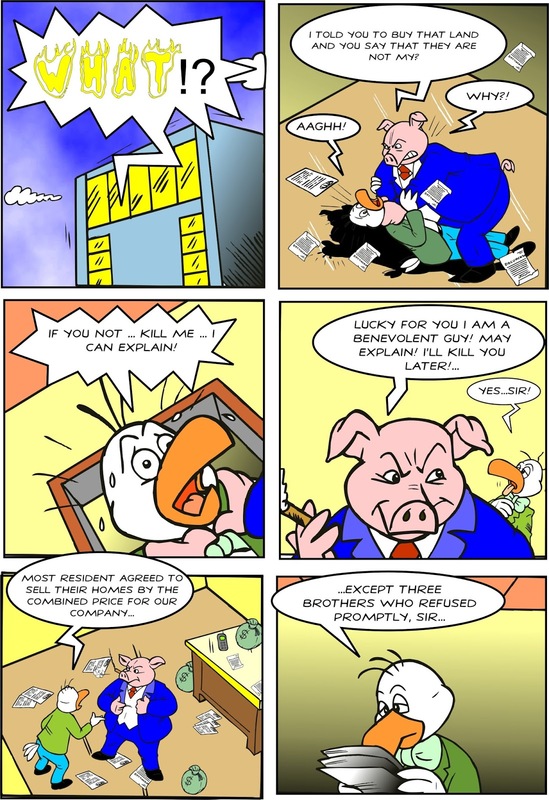 Here you see our little friend is struggling with his enemy JOE PIG a hilarious plot in the middle of a famous fairy tale in reverse. Well ... for you to understand better, let's read the story and then you will kill the charade! HAVE FUN! 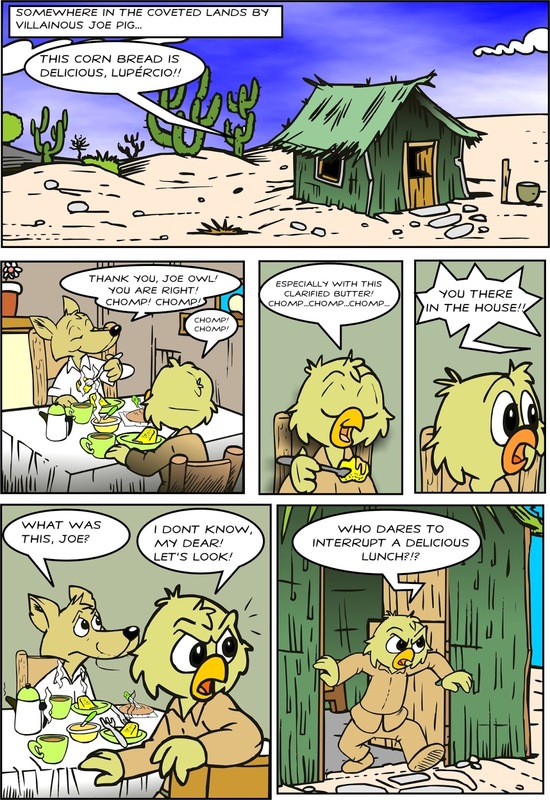 ZÉ CORUJA WILL TURN JOE OWL! The hero stories will have versions in English. Good morning to all my friends and readers of this BLOG. Before speaking to newness Sobreo title above, I want to thank all of you who follow the JOE OWL from the beginning when this page was created. I believe JOE and his friends, so as the gnome Melque had a legal acceptance with you. These characters that you have come to know are also published in the magazine PRISMARTE (see www.prismarte.com.br). The reason of this article is to say that I was very pleased with the acceptance of the character and say I was surprised to find that it is also read in the outside world. Besides BRAZIL, blogging is also displayed in the US, RUSSIA, GERMANY, POLAND, FRANCE, TURKEY, SPAIN, Malaysia and UKRAINE. Imagine my happiness to know that Joe is read in all these countries! I would like to thank all of you for visiting these countries to my blog. Well ... in thanks to this I will publish this and all following stories in English as well. For you to know better and faster way to each of our characters. But why in English? Well, not wanting to look down on others languages, which I respect, English is a more universal language and many people anywhere in the world have a certain knowledge of the language! Sure! There is also the GOOGLE TRANSLATOR which is a very useful tool and which I also do use. And how will the publication of the stories? I will start by this story you are reading. So I conclude the publication of it in Portuguese, I publish it in English! After publish her sequence in Portuguese and then the same in English. 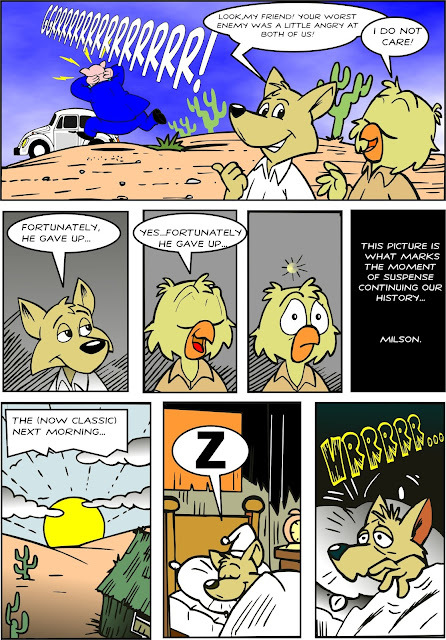 And to conclude, the third and final part of this story in portuguese and then publish in English. Hence, all the stories I publish in Portuguese will publish the English version, right? You readers from anywhere in the world familiar with the language can also give your suggestions, tell how some English mannerisms and expressions in English, can help me fix some mistakes as well as I'm learning too. Give your opinion, curtam, praise, criticize (provided it is constructive criticism, of course!). Who knows this can not be a way to learn a new language especially for people who travel a lot does not it? How can you send your opinion, criticism, praise and etc. Maybe I can not respond to everyone but I will read all the emails sent to me. I once again on behalf of P.A.D.A. 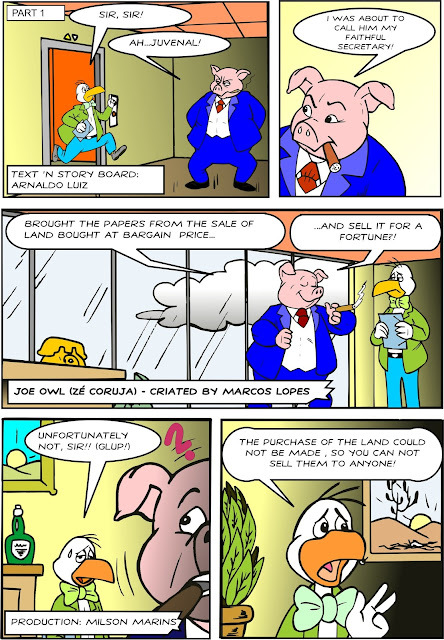 PRODUCTIONS, Arnaldo Luiz, Milson Marins José Valcir, thank everyone and I'll see you around with the adventures of JOE OWL and his friends! See you! E agora? O que será do nosso estressado lobinho que não tem mais onde morar? O "balofo" ZÉ PORCO conseguiu destruir a casinha do LUPÉRCIO e este agora não tendo mais onde morar é forçado à se retirar de sua propriedade. Com essa situação, terminamos a primeira parte desta aventura. Não deixe de acompanhar as sequências e as novidades que virão neste BLOG. O que foi isso?! Um violento vendaval? Um terremoto? Um Tsunami? O que será que aconteceu com a casa de palha do nosso amigo LUPÉRCIO? Não! 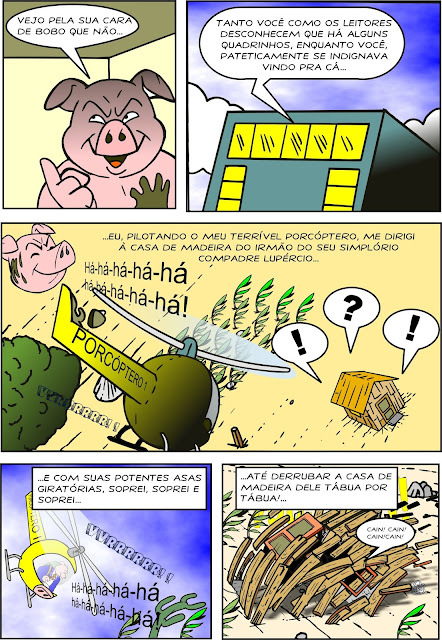 Foi o nosso conhecido e odiável vilão ZÉ PORCO com o seu sinistro PORCÓPTERO I que mandou pelos ares a casa do nosso amiguinho. Olha só como o ZÉ PORCO saiu arretado! O LUPÉRCIO canta vitória, mas, o ZÉ CORUJA conhecendo o vilão como ele conhece,sabe que não será bem assim.